January | 2011 | Let Teddy Win! The Washington Nationals presidents race audition details have been announced for 2011. 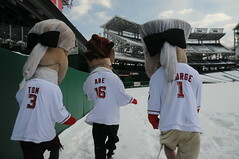 In what has become an annual tradition, the Nats will be holding auditions on Presidents Day weekend for candidates who want to compete as racing presidents George, Tom, Abe, and Teddy at Nationals Park. The tryouts will be held on Saturday, February 19th. In previous years, candidates have been asked to run a 40-yard dash, race on the field, dance, and show their celebration skills during the tryouts, which are held rain or shine. Last year, the auditions went forward in deep fresh snow, which made for a cold but hilarious afternoon. Presidents race auditions are closed to the public. If you’d like to score an invitation, e-mail a cover letter, resume and recent photo to entertainment@nationals.com and include “2011 Racing Presidents” in the subject line. The team typically invites 50 to 60 finalists to the auditions.